Cory Schneider heard his name mentioned in rumors more than once leading up to the NHL's March 3 trade deadline. After all, most hockey observers consider the Manitoba Moose goaltender to be one of the top young keepers currently playing in the AHL. 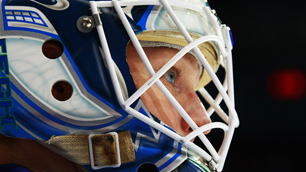 And with Olympic gold medalist Roberto Luongo boasting a new long-term contract and firmly entrenched as the starter with the parent Vancouver Canucks, it would only be natural for Schneider to preoccupy himself with thoughts about his future. 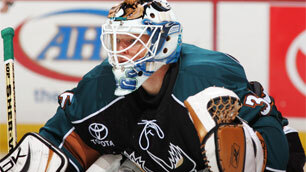 But Schneider, who enjoyed a monster 2008-09 season that resulted in his selection as the AHL's Goaltender of the Year, tried to take the attention and the constant speculation in stride. "It's out of my control," Schneider said, "and until someone calls to say I've been moved, it's not something that I'm even going to worry about. Sure enough, the deadline came and I wasn't moved. It's not something that's at the forefront of my mind." Schneider, who turns 24 Thursday, has come a long way in three years' worth of professional hockey to even be on the radar of organizations looking for help between the pipes. A native of Marblehead, Mass., Schneider was a first-round draft pick (No. 24) by Vancouver in 2004 and turned pro after backstopping Boston College to consecutive appearances in the NCAA championship game in 2006 and 2007. He joined the Moose to begin the 2007-08 campaign, and to say his pro career got off to a rocky start would be an understatement. After 11 appearances, the rookie's record stood at 3-7-0 with a goals-against average of 3.69 and a save percentage of .872. "I really learned to appreciate the game and the skill level of these players in the American League," Schneider said. "Turning pro after college, I think I assumed it wasn't going to be that big of an adjustment. Coming in and being humbled a little bit, realizing how hard you have to work in practice and every single game, that took a little while to understand." With Schneider consistently losing and Moose teammate Drew MacIntyre consistently winning, Schneider's struggles finally reached a breaking point with head coach Scott Arniel just prior to Christmas. Schneider had been yanked from a Dec. 14 game vs. Lake Erie after getting torched for three goals on eight shots. With MacIntyre on recall to Vancouver at the time, Arniel's options in net for the next night's rematch were to go with an ECHL call-up or to put Schneider back out there. "I called Cory into the office the next morning and kind of laid into him about what it takes to be a professional," Arniel recalled. "We had a real sit-down, he didn't do a whole lot of talking, I did most of it, and I proceeded to tell him that he didn't deserve it, but he was going back in the net that night." After all the success Schneider had experienced during his college career, this experience marked a world of difference. "Coach Arniel was one of the first guys to sit me down, look me in the eye, and tell me I wasn't good enough, something that I hadn't really heard a lot growing up," Schneider said. "Sometimes it's something you need to hear. "That's something I'll never take for granted again -- these are jobs, a lot of people would love to have them, and you can't get complacent because someone's going to take your job if you don't perform up to expectations." It's probably not a coincidence that Schneider's rookie season began to turn around after the face-to-face with Arniel. He won the rematch with Lake Erie that night, also earned victories in his next three outings, and went on an 18-5-2 run (1.72, .935) with two shutouts to close the regular season. By the end of the year, his play had improved to the point that Arniel tabbed him over MacIntyre as Manitoba's starting goaltender in the playoffs. "Not because he was a high prospect, but because he was the best goalie in the second half of the year," Arniel said of the decision. 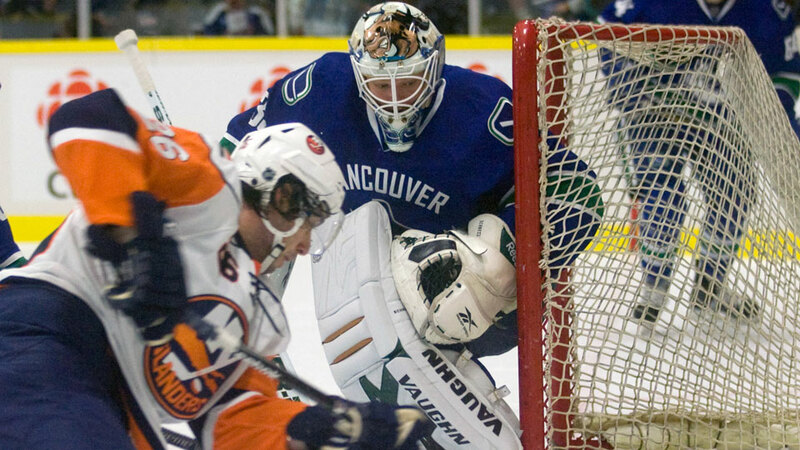 After digesting the ups and downs from his rookie year, Schneider returned and tore up the AHL from beginning to end as a second-year pro in 2008-09. He took the loss in Manitoba's season-opener on Oct. 10 but promptly rattled off 13 consecutive victories -- with his first NHL recall to Vancouver mixed in -- and did not lose again until mid-January. That defeat was followed by a 7-1-1 surge, and by season's end, Schneider led the AHL in both goals-against average (2.04) and save percentage (.928), ranked third with five shutouts, and posted a 28-10-1 mark in 40 appearances for the Moose en route to winning the league's Baz Bastien Award as top goaltender. "I set out some goals after my first year, where I made big progress," Schneider said. "It was kind of a perfect storm where we had a great team, a good coaching staff and support group, and for me it was about really establishing myself and showing that the end of my first year wasn't a fluke, that I could do it for an entire season." 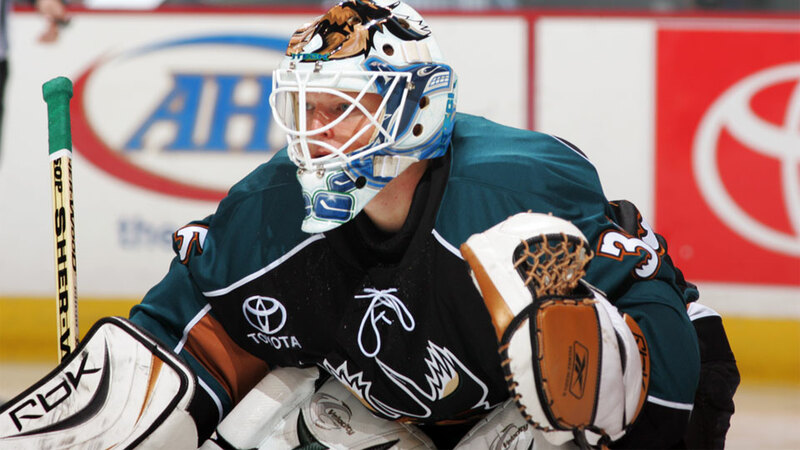 That trend continued in the 2009 Calder Cup Playoffs, where Schneider backstopped the regular-season champion Moose all the way to the Calder Cup Finals, where they ultimately fell in six games to the Hershey Bears. 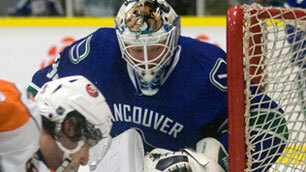 "I think his size and athleticism are probably his best attributes," Arniel said of the 6-foot-2, 195-pound goalie. "His ability to read the play -- at times you wonder how a puck can go from one side of the ice to the other, and there's Cory sitting there waiting for it. He anticipates and reads the game really well." Schneider has been a workhorse in Manitoba's net this season, already appearing in nine more games than he did all of last year. Despite opponents' best efforts to create traffic and throw him off his game after his breakout season, Schneider continues to stand tall. He's matched his 2008-09 win total, and on a club which ranks among the AHL's bottom third in goals per game this year, Schneider's stellar play in net has been key to keeping Manitoba in a playoff position with four weeks to go. "It's been good for me ... it's a different dynamic," Schneider said of playing behind a more offensively-challenged squad than a year ago. "It's good to learn both aspects, going from making a big save here and there to having to steal games and keep your team in it." 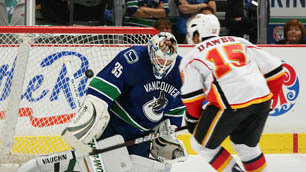 Schneider's consistency and continued success in the AHL has been enough to catch the eye of scouts across the country, even though he's totaled only 10 career NHL appearances for Vancouver thus far. "He's earned the right to be spoken about," Arniel said. "Whatever Vancouver decides to do, he'll just have to wait and see. His focus -- not letting things distract him -- he's one of the best young goaltenders I've seen to do that, and it's a big reason why I think he's going to be a real good NHL player." Asked if it's at least nice to hear his name mentioned, Schneider relented ... a little. "Obviously, the other side of being part of trade rumors is that other teams want you. It's flattering that teams are interested, but it's not something I think about until it's actually going to happen."